A little shot taken in the gathering dusk on a rough pathway in Woodborough, Nottinghamshire last Sunday night. I always think that wild flowers can be some of the most attractive of all in their natural state. The Hardy Geranium is often confused with what we think of as a geranium, the much seen pelargonium or ‘garden geranium’ which helps decorate so many pretty garden pots, and hanging flower baskets during the summer months in the UK. 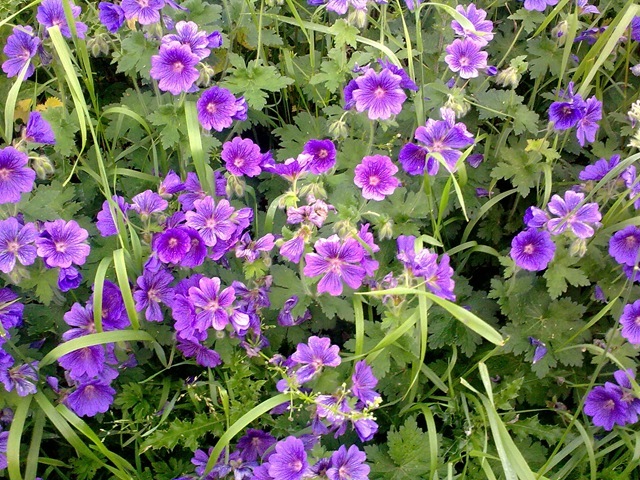 The Hardy Geranium bears little similarity to it’s bolder, brasher and much more showy alter-ego. This perennial has by nature a smaller, bushier habit often with a mass of small flowers. It is a vigorous grower and can often colonise a large area as it seeks to spread itself by virtue of its many runners. A lovely flower indeed Stu, but as you note, ‘a vigorous grower’. I had some in my garden in Cambridge and the b@*#&rd stuff took over. I’d recommend NEVER introducing it to your garden as it is a perpetual war in trying to keep it down. You can never clear out all the tiny bits of root which will propagate themselves relentlessly. Even now I can picture the hapless new owners of my old house taking to the top corner of the garden with a flame thrower. Stick with the showy version in pots I say. I think I read a report on your geranium back in Cambridge, Fraser. It’s apparently now reached the perimeter of Bishop’s Stortford and is heading south. What on earth did you feed it on, minced up Jambo? I have a couple of hardy geraniums in my garden providing a perpetual war. They’re small beer compared to the lions and tigers parading my savanna-like lawn though. Then there’s that Japanese soldier that’s been holed out since 1944 in my herbacious border. Tough times. I can’t wait til I get a Wellington garden. Things grow like *#&$ here – lots of rain and sunshine,mild temperatures, fertile soils. You used to be able to buy flamethrowersin the 1930s from the general store that evolved into the Farmer’s department store chain. I can just imagine mate. It just seems to be perfect growing conditions that you describe over there. What do you have in mind, will you grow any food at all? I think in these days of the somewhat bland stuff we can get in the supermarkets it’s very worthwhile. Crivvens. Went to see a house on Sunday where they were obviously keen on geraniums. The garden had somewhat ‘gone to seed’ and sported several clumps of your more typical indoor geraniums which had sprouted to triffid-like proportions. Scary. Not buying the house – it was even scarier. One decent earthquake (not rare here) and the whole place would be off down the hill like a toboggan. But yes, I wouldn’t mind some space to cultivate my own veg Stu – definitely not just a recession buster but better for body and soul altogether.